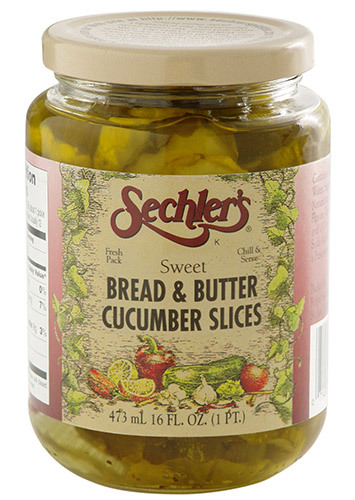 These are a fresh Pack pickle- a more traditional Bread & Butter Pickle.16 ounce Bread & Butter Cucumber Slices are fresh cucumber slices combined with bread & butter slices. From Paul Goodman of San Diego, California on 3/7/2019 . I just had six jars shipped to me in San Diego. I’ve tried other pickles in my local stores, but none has the flavor of these. From Beverly Jacobs of Evansville, Indiana on 12/11/2018 . From Kerri Ritchie of Middlebury, Indiana on 9/6/2018 . Best Bread and Butter pickles ever !!! From Krista Stalter of Bloomington, Illinois on 1/25/2018 . These are THE best bread & butter pickles of any brand! I was disappointed that I couldn't find them anymore at my local grocery store. I was very happy to locate your online store so that I can again enjoy the best pickles ever! I ordered enough to stock my cupboard to last for awhile, but will definitely be returning to your online store to continue to order more! From Anonymous of Houston, Texas on 4/9/2017 . I love these pickles! When I could no longer find them in the Houston market, I started buying them on line, because they have spoiled me for the bread and butter pickles I find in the stores. When I was growing up, a friend's grandmother made bread and butter pickles, and yours taste like hers!